The Bissell Little Green ProHeat 1425 series carpet cleaner stands out as the most well-known spot cleaner model with a built-in internal heater. It will heat the water up to 25°F (degrees Fahrenheit) above it’s original temperature. For many users, this is a good idea, as heated water often makes cleaning more effective. Overall, the Little Green ProHeat is a great compact cleaner for cleaning carpet stains and upholstery, including car interiors. It comes with a flexible hose and two hand tools, a tough-stain brush and a spraying deep crevice tool. Built-in Water Heater – The Bissell Little Green Compact ProHeat 14259 deep cleaner is the #1 best-selling portable spot cleaner unit equipped with a hot water heater. It will heat water up to 25 degrees Fahrenheit (°F) warmer. Heating the water to a higher temperature is optional, but doing so will provide the best results. Water will heat to the optimum cleaning temperature within 30 seconds. A light illuminates when the correct water temperature is reached. Two Tanks – Separate easy to remove or insert water tanks are provided for clean and dirty water. The large capacity, 48 oz dirty water tank means less trips to the sink for emptying. Either hot (not boiling) or cold tap water can be used to fill the tank. Lightweight (13 lbs) and Compact – The Bissell Little Green Machine weighs 13 lbs before water is added. Its dimensions are 8.2″ by 17.25″ by 12.5″. The cord wrap fixture allows the 15′ power cord to be wrapped against the side of the unit, while the flex hose wraps around the base of the unit and is secured by a clip to provide a small storage footprint. 9 Amps Power – With 9 amps of power, this has the highest motor power compared to all other Bissell machines. Part of the high amperage is meant for powering up the water heater. 2 Hand Tools Included – This Bissell Little Green Proheat package comes with a stain brushtool with a 3″ cleaning path, which is ideal for spot cleaning uses. A crevice tool is included for narrow, difficult-to-reach-spots. An earlier Amazon listing may have included a turbo brush, but to be clear, the current ProHeat package comes with the crevice tool in place of a turbo brush. 1 Year Warranty – In most instances, Bissell will repair or replace broken or damaged components on the product free of charge within the warranty period, if the damage was not due to negligence or improper use. This Little Green Proheat machine has a reputation for being quite durable and a number of users have reported it holds up well under frequent use. 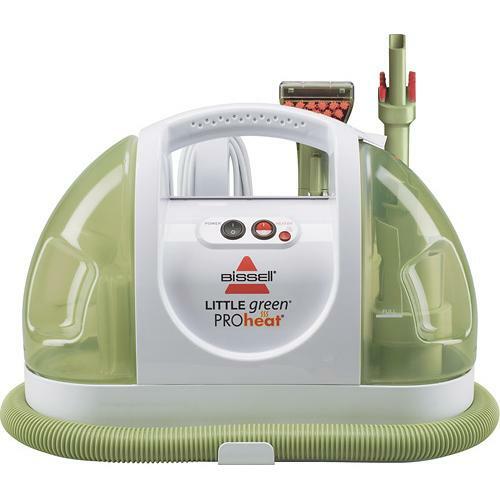 The Bissell Little Green Proheat quickly removes spills and stains from carpets, including stains that have been present for several months, or even a year or more. The fact that the suction removes most of the moisture is a very positive feature. It ensures that watermarks will not likely be left behind when fabric upholstery or even microsuede upholstery has been cleaned. The brush-head is not motorized (turbo powered), although users can purchase an optional turbo brush tool to work with the machine. It sounds fancy but is not necessary for most users. The included brush tool is more than adequate for scrubbing and cleaning out stains. For really challenging stains, you could also use a separate handheld carpet brush and cleaning solution to pretreat and scrub the spot before using the Bissell Little Green Proheat to do one last round of scrubbing and suctioning out the dirty water mix. This methodology can be very powerful. As this Bissell carpet cleaner is intended for cleaning up spots and smaller stains, some users may find the cleaning brush to not be as wide as they might like when cleaning larger sections of carpet. The large capacity tanks are a plus, and the unit is small enough to be easy to carry and to store. It’s also referred to as a multi-purpose cleaner, for besides cleaning carpets, it can be used on upholstery and auto interiors. Some people call this a wet vac, or wet vacuum, as it suctions in the dirty water from the carpets. The combination of cleaning power and portability make this an ideal cleaning accessory for households that frequently experience spills or pet messes. Not only do the stains get treated before they have a chance to set-in, it’s also very convenient to use. It’s a chore to lug out a heavy upright home cleaner, or going to the store to rent a Rug Doctor. A lot of users find the compact Little Green Proheat unit helpful for cleaning automobile interiors, such as the carpets and upholstery, as well as home furniture and upholstery. The Crevice tool is helpful for cleaning the crevice areas of car interiors and car seats. Users see the value here, as the cost of this Little Green machine more than pays for savings from auto detailing costs. Assembly is a simple, 3-step process. The flex hose clip is attached by sliding it into an opening of the front of the unit. The flex hose bracket slides into a slot and is secured with two Phillips head screws. The tool clip holder simply slides into a slot on the flex hose bracket. Directions for operating this multi-purpose deep cleaner are easy to read and follow, and include instructions for cleaning the unit after use as well as troubleshooting tips. The tanks are removed by lifting them from their base. The caps are then removed for filling or emptying. Once the caps are replaced, each tank slides easily back onto the base. Although the Bissell Little Green ProHeat Compact Multi-purpose Carpet Cleaner 14259 features a high 9 amps in motor power, the high power is likely needed due to the internal heater. As a comparison, the regular Bissell Little Green 1400 cleaner has 3 amps of motor power. According to Bissell, the SpotClean Pro 3624 is still their “most powerful cleaner,” with “superior suction,” even though on paper it only has 5.7 amps of power. Users looking for high power specifications may also want to consider the Rug Doctor Portable Spot Cleaner with 10 amps of power and no internal heater. Note that this is not a steam cleaner that will heat water up to steaming hot levels. Home deep carpet cleaners do not usually come with internal water heaters. For better heated cleaning, users can add hot water to the tank to start with. Empty and rinse the tanks after using the unit, especially the dirty water tank. Although the tanks are designed not to leak when in use, it is less clear when being stored if the tanks are not empty. The instruction booklet indicates that it is alright to leave water mixed with formula in the clean water tank for the next use; but according to the experience of fellow users, one may want to be cautious about this. Whether you are cleaning carpets or upholstery with this unit or another portable carpet cleaner, it’s always a good idea to check out the cleaning instructions from the carpet/upholstery manufacturer and test in a hidden area first. The instruction manual for this cleaner also has plenty of good advice and tips to facilitate the best results. The stain tool has a wide spray, but this is good. If held against carpeting properly, excess spray will not be a problem. Users could cover areas that they do not want the spray to get on. The tool also needs to be held against the carpeting for the suction to be most effective. Should You Buy the Bissell Little Green ProHeat Carpet Cleaner? If you want a portable spot cleaner with a built-in heater, this is the best choice. Whether you have pets that leave messes behind, or little children who may inadvertently spill liquids on carpets, this small lightweight unit can be quickly brought out to get rid of the stains. This small multi-purpose cleaner unit makes it easy to keep the carpeting clean, or to clean out spills on car seats. Overall, users can expect to get their money’s worth. 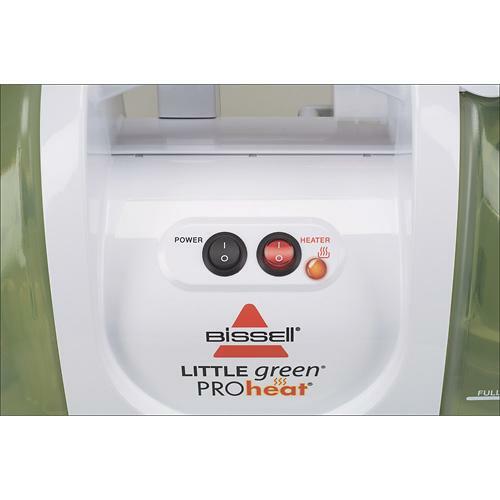 Not sure if the Bissell Little Green ProHeat is right for you? Compare this model to others in the Portable Carpet Cleaning Machines Reviews section. The closest models to compare this with are the Bissell SpotClean Portable Carpet Cleaner 5207 and Bissell Little Green without the heater. For cleaning larger areas, consider lightweight upright cleaners instead.